When smartphones took over in the early 2000s, data usage and cellphone bills went through the roof for many families — mine included. My family’s shared data plan wasn’t perfect — some months, someone would rack up data usage and leave the rest of us strapped — but it allowed each person to pay a lot less per month than if we each had an unlimited data plan. In many ways, shared hosting is similar to a family data plan: Responsibility is shared among users, and you’ll be in trouble if you exceed your allotted portion of resources. VPS hosting, however, is more like an individual data plan. While you’ll pay more money to customize it to your needs, you’ll get more resources and control over changing your data setup as you see fit. Selecting the right hosting service depends on several factors, including resource needs, performance demands, security requirements, cost constraints, server administration preferences, and scalability expectations. Read on for our comparisons and recommended hosts. Simply put, shared hosting means your site will share the same server as many other sites. It’s usually the cheapest option but comes with limited bandwidth, administration, and performance capabilities. VPS hosting is a more premium option, with the ability for greater customization and increased performance. But, as with any premium service, you’ll have to pay more to get more. Next, we’ll cover the key points to consider when choosing between shared and VPS hosting. As the names imply, shared hosting customers share server resources, whereas dedicated hosting users get a server dedicated to their sites’ needs. A VPS lies in the gray area in the middle — a bunch of slices of the same server acting as their own dedicated hardware entities. That being said, there are pros and cons to both sides of the shared/VPS resource allocation spectrum. When you share server resources with others, you’ll face some limitations. While no single account will impact another’s experience, per say, there will be maximum available CPUs, memory/RAM, and disk space. Your website will not be able to use resources beyond the maximum allowed. This may not be a big deal if your website doesn’t require a ton of space or processing power. With VPS hosting, you’ll enjoy greater private disk space and higher overall resource availability. This will be necessary if you want to expand your business and need to offer customers a user experience that goes beyond the basic shared hosting level. As you might guess, more resources means more performance. Shared hosting is only as performant as the technologies your host has implemented for speed (e.g., SSDs, caching software, a CDN, etc.). Typically, you have more control over the performance factor with a VPS, but let’s go a little more in-depth. As with any shared plan, other websites could possibly affect your website’s performance – it’s the risk you run by opting for the more economical shared hosting plan. However, if your performance demands are limited and you value ease of maintenance, shared hosting will likely yield a higher return on investment. It’s no surprise that VPS hosting offers better overall performance based on the bandwidth it offers users. You’ll have more flexibility to configure your applications on the server, but you’ll need to make sure you have a dedicated system administrator to keep the server running smoothly. If you have high traffic demands or multiple sites to manage, VPS will be the better option. While sharing server resources presents huge benefits from a cost point of view, it can wreak havoc on the security end of things. It really depends on how much the hosting provider has invested (both operational/team and purely financial resources) in ensuring dedicated protection for its shared hosting customers. While shared hosting is considered very safe, be aware that security breaches can occur simply because a common server cannot guarantee 100% security. The main reason for this is what we call the Noisy Neighbor problem — or the fact that when one shared hosting customer makes a mistake or experiences a technical difficulty, it’ll likely impact other sites because you are all sharing space on the same machine. While both VPS and shared hosting involve sharing one server’s resources, they have distinct differences. Customer support will likely also be limited compared with VPS hosting. However, if your site won’t require sensitive personal information from users, you shouldn’t have an issue with shared hosting. You can ensure your site’s security with more robust safety features that are only available through VPS hosting. If your budget allows, you can implement better customer support services that will assist patrons when they need it. If your business needs to protect personal data, it’s worth considering the upgrade to a VPS. Pricing for web hosting is a funny thing. You can easily find yourself paying an arm and a leg (upward of $18 per month) on shared hosting and absolutely hate the piss-poor service, or you could spin up a VPS instance for as little as five bucks and never look back. Those are extreme scenarios, of course, but hopefully, you catch my drift. While shared hosting is the best for affordability and ease of use, VPS hosting reigns supreme for scalability. Aim for a balance — high-quality features (as many as you require) meets low-as-possible price. With shared hosting, you defray the expenses associated with running and maintaining a server because you’re sharing server space with thousands of other websites. From a pure price point, shared hosting is the most economical choice and is a great option for those looking to host a site with standard functionality. As with any paid service, a more expensive plan offers more premium features, and the same rings true for VPS hosting. If you want to improve your website’s performance, or if you need to increase your business’s online services, VPS hosting will give you better customization and performance options than shared hosting. Long story short, shared hosts handle the hardware for you. You’re responsible for managing your VPS — unless you choose a host that handles server monitoring, bug fixes, and security patches for you (i.e., managed hosting services). If you choose to host your website on a shared server, there is little to no technical maintenance of the server required on your end. That means you can enjoy basic server administration for your website at no additional cost to your budget or your precious time. For many, this is a huge plus as no dedicated system administrator is needed. VPS-hosted websites are often more complex in terms of resource management and therefore will usually require a specific system administrator to focus on maintaining the server. The tradeoff is that you’ll be able to customize your site and configure whatever applications and software you want while increasing performance and security. The scalability factor is the tipping point for the shared-vs-virtual server debacle. If your site sees, or is expected to see, roughly 30,000 monthly visitors, a shared host can accommodate you and your site’s hosting needs. Much more than that and you might start receiving internal errors from your host. You’ll then need to consider a VPS or dedicated plan, and a VPS can handle any amount of traffic. While shared hosting is a great option for the short-term, you might face scalability issues in the long run depending on how your website grows. If you find you’re maxing out your storage capabilities, or if user demand is exceeding server space, you may need to consider scaling up to eke out better performance. The customizable features of VPS hosting allow you to scale more quickly and easily. If you predict you’ll eventually need to scale up on the fly to meet demand, the investment in VPS hosting now may pay off in the future. As is the case with any cellular data plan, you want to know where you can get the best coverage for the most reasonable price. How can you possibly evaluate which providers truly offer the best deal amid the marketing jumble? 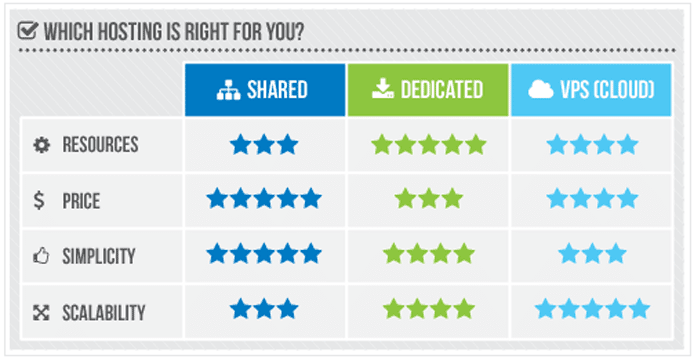 Here’s our gift to you: the top recommendations for both shared and VPS hosting plans. We scoured the web and evaluated countless plans, ultimately selecting the cream of the crop and sharing them here. You’re welcome. We cover a lot of variables when judging shared hosting providers, especially since we know we’re often guiding first-time website owners. The hosts that get our seal of approval make plenty of server resources — bandwidth, storage, memory, et cetera — available for a competitive price, and they often throw in free perks such as a complimentary domain name registration. Ease of use is an important consideration, too, so bonus points go to those with drag-and-drop website builders or easy installation options for popular tools like WordPress. Below you’ll find the most affordable, best value shared hosts on the market today. VPS plans are judged based on hardware quality, support level, price, and customization options. We find the top providers offer flexible packages that can be easily configured (much like the servers themselves) to best meet dynamic needs. An extra gold star goes to those that throw in added benefits such as SSD storage, pre-installed WordPress, a CDN, and 24/7 security monitoring. Check out the top VPS plans below. After several years of dealing with limited data availability on my family plan, I decided to leave the data battles behind and upgrade to a plan that offered me unlimited data usage. While I now pay a premium for the service, I enjoy increased media streaming, GPS app usage, higher quality image resolution, and other perks. In the end, the cost-benefit analysis led me toward the more expensive option; however, the rest of the family remains on the data plan, and it continues to work for them based on how much they’re willing to spend for these services. Having your own dedicated server — even a virtual one — brings new scaling potential, but make the decision wisely! The decision to host your website on a shared versus a virtual private server is an important one. For a majority of sites, a shared hosting plan will more than suffice. But if you’re seriously considering a higher-end hosting plan, here are some signs it’s time to migrate to a VPS. Identify the reasons you’ve outgrown shared hosting, or why a VPS may be appropriate. Determine which features are most important to you. Pro/Con lists are very useful! Compare prices and providers as part of your decision-making process. Conduct your own cost-benefit analysis. Project your long-term business growth. Are we looking at a major growth spurt? With this information in mind, you’ll have your website on its way in no time at all.